A geyser is a hot spring which shoots out water and steam. They erupt when pressure has built up, often at regular intervals. There are about a thousand geysers around the world. About half are in Yellowstone National Park, Wyoming, United States. Geysers are made in special geological conditions. Only a few places on Earth have these conditions. Because of this, geysers are not very common. One place is the Yellowstone National Park, which is the remains of a gigantic volcano. Another is Iceland, which sits on top of the Mid-Atlantic Ridge, where new Earth's crust is formed. Geysers are often near active volcanos. This is because the geyser is caused by magma. Surface water usually goes down to about 2,000 metres (6,600 ft). There, it mixes with hot rocks. The pressurized water begins to boil. When it is pressured enough, hot water and steam burst out of the geyser. Individual geysers do not last forever, but systems of geysers last as long as the geological situation continues. The oldest individual geysers are only a few thousand years old. Geysers are usually near volcanic areas. As the water boils, the pressure increases. This forces hot steam and water to the surface through the geyser. Geysers are usually made because of three things that are around volcanoes. A geyser needs a lot of heat . This heat comes from magma. This magma needs to be near the surface of the earth. Geysers need much more heat than is usually found near the earth's surface. This is why they are often around volcanoes or volcanic areas. The water that bursts from a geyser must travel underground through deep, high-pressure cracks in the earth's crust. For the heated water to form a geyser, a plumbing system is needed. The water needs to be held while it is being heated. The plumbing system is made up of a system of fractures, fissures, spaces and sometimes cavities (holes). Most importantly, the temperatures near the bottom of the geyser become high enough to start boiling the water. Steam bubbles come out of the top of the column. They burst through the geyser's vent. Some water flows or splashes out. This makes the weight of the column of water and the pressure on the water below less. When this pressure is released, the hot water turns into steam. It boils violently. There are several bodies in the Solar System where jet-like eruptions, often called "geysers" and "cryogeysers", have been seen. Unlike geysers on Earth, these are eruptions of gas, together with dust or ice particles, but without liquid. Water vapor streams have been seen near the south pole of Saturn's moon Enceladus. Nitrogen eruptions have been seen on Neptune's moon Triton. Carbon dioxide eruptions from the southern polar ice cap of Mars have also been seen. ↑ The word geyser comes from Geysir. Geysir is the name of an erupting spring at Haukadalur, Iceland. Geysir's name came from the Icelandic verb geysa. This means "to gush (pour, flow)". The verb from Old Norse. 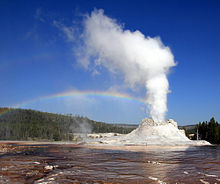 ↑ 2.0 2.1 "geyser (geology) -- Britannica Online Encyclopedia". britannica.com. Retrieved 15 July 2010. ↑ 4.0 4.1 4.2 4.3 4.4 "Conditions needed for the formation of geysers". wyojones.com. Retrieved 15 July 2010. Glennon, J.A., Pfaff, R.M. (2003). The extraordinary thermal activity of El Tatio Geyser Field, Antofagasta Region, Chile, Geyser Observation and Study Association (GOSA) Transactions, vol 8. pp. 31–78. Glennon, J.A. (2005). Carbon Dioxide-Driven, Cold Water Geysers, University of California, Santa Barbara. Originally posted February 12, 2004, last update 6 May 2005. Accessed 8 June 2007. Glennon, J.A. (2007). About Geysers, University of California, Santa Barbara. Originally posted January 1995, updated June 4, 2007. Accessed 8 June 2007. Glennon, J.A., Pfaff, R.M. (2005). The operation and geography of carbon-dioxide-driven, cold-water geysers, GOSA Transactions, vol. 9, pp. 184–192. Kelly W.D., Wood C.L. (1993). Tidal interaction: A possible explanation for geysers and other fluid phenomena in the Neptune-Triton system, in Lunar and Planetary Inst., Twenty-Fourth Lunar and Planetary Science Conference. Part 2: 789-790. Soderblom L.A., Becker T.L., Kieffer S.W., Brown R.H., Hansen C.J., Johnson T.V. (1990). Triton's geyser-like plumes — Discovery and basic characterization. Science 250: 410-415. Allen, E.T. and Day, A.L. (1935) Hot Springs of the Yellowstone National Park, Publ. 466. Carnegie Institute of Washington, Washington, D.C., 525 p.
Barth, T.F.W. (1950) Volcanic Geology: Hot Springs and Geysers of Iceland, Publ. 587. Carnegie Institute of Washington, Washington, D.C., 174 p.
"Yellowstone National Park - Geysers and How They Work". nps.gov. Retrieved 15 July 2010. "Geyser Observation and Study Association (GOSA)". geyserstudy.org. Retrieved 15 July 2010. "Geysers of Yellowstone: Online Videos and Descriptions". yellowstone.net. Retrieved 15 July 2010. This page was last changed on 13 March 2019, at 23:20.